New restaurant managers Tina and John Melancon, pictured left and right, and Penobscot Painters contractor Steve Skillin have been hard at work getting the restaurant ready for opening day, set for May 1. A new name, a fresh start, and a different vibe. That is the driving force behind an ambitious renovation being done at the former location of The Wharf on Sea Street in Castine by new managers John and Tina Melancon. “We wanted it to be something new, something funky, that really catered to the locals but also gave the summer visitors what they want as well,” said John Melancon, who will also be the chef when the restaurant opens in May. 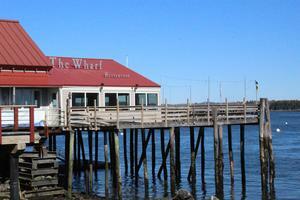 The new name will be 15 Sea Street Bar and Grill, a play on the restaurant’s physical address. It will feature happy hour favorites such as oysters and beer discounts, and summer favorites including lobsters, steamers, burgers and more. Some of the food, though, will have a little Cajun twist, an homage to John Melancon’s Acadian roots. Desserts will all be made in house by Tina. 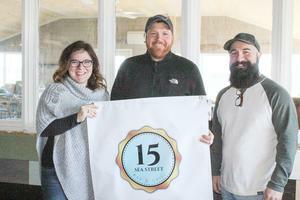 The couple, who is expecting their second son at the end of June, said they are excited to bring some fresh, new ideas to the restaurant, including what they are calling the Maineiac Challenge. While the couple has been brainstorming ideas for different events throughout the year, the first order of business was to address the renovations they wanted to do, including new wood paneling in the main section of the bar, closing off a back bar, putting down new floors, putting up new walls, and gutting the kitchen, which the Melancons estimated was about 35 years old. They brought in Steve Skillin, owner of Penobscot Painters, and his crew to do the work. Skillin and his team have been in the building every day since late November, and while the work has been going according to their timeline, Skillin said it has not been without some painful roadblocks. Despite those hiccups, the Melancons said they have been enjoying the process, even though most days it means taking their work home with them at night. “There are nights where we’re just sitting there like ‘what about this? Should we do this?’ and then it’s like ‘no, how about we just take some time and enjoy each other,” said Tina. “I’d say that’s definitely turned into our lives,” said John. The couple has just started the process of advertising for workers, which includes every position from sous chef to barback. While he would love to have people with a “boatload of experience,” John said he primarily just wants people who are willing to learn and excited to be a part of the restaurant. The Melancons are also looking to “bring the fun back,” and plan on making the restaurant “music centered” with everything from zydeco to country pop, depending on the crowd. “That makes it fun, you know, and it keeps people hanging out a little longer,” said John. The restaurant will stay open longer, both in hours and months, than it has in the last couple of years, depending on the time of year and how busy things get. At minimum, they plan on staying open 10 months out of the year, and the latest they will stay open is 12 a.m. 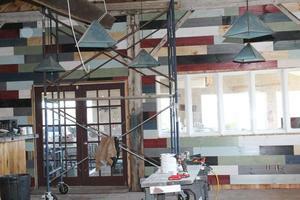 The opening date, providing renovations continue to stay on track, is set for May 1. While the sign outside the building still says The Wharf, the Sea Street restaurant will operate under a new identity come May 1, as 15 Sea Street Bar and Grill. Penobscot Painters contractor Steve Skillin and his crew put in full days to get the renovation at 15 Sea Street Bar and Grill done by opening day, set for May 1.